A serval cat at Serengeti National Park, Tanzania. Some sources seem to indicate that living with a serval is no more challenging than feeding your pet goldfish. At the other end of the extreme spectrum, many sanctuaries and animal rights activists paint servals and other exotic cats as unmanageable creatures that no ordinary mortal could hope to deal with successfully. As is usually the case, the truth lies in a rational world between the two extremes. Servals are much more challenging and time-consuming to raise than a domestic cat. 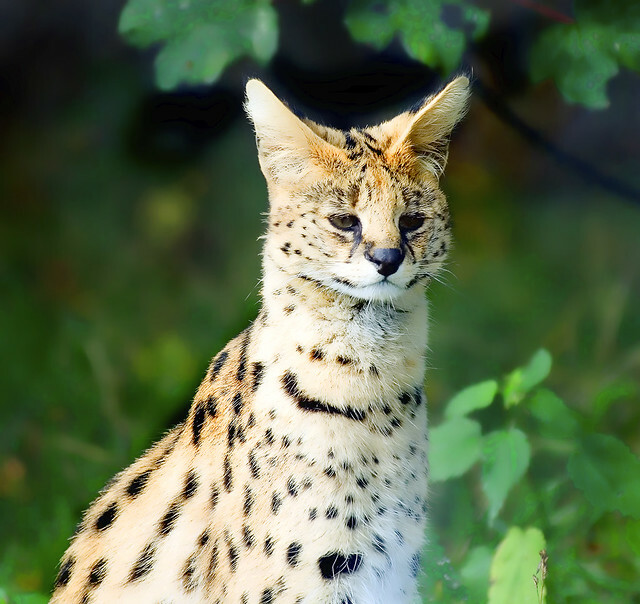 In order to end up with a tame, safe, and loving serval that can live in your house, you are going to have to spend a lot of time socializing, training, and housebreaking him. These things don't happen automatically with a serval. There will be problems to overcome. In order to do so, you will need a solid understanding of how animals learn and how to humanely modify their behavior. This is not an animal for an inexperienced pet owner, or even for an experienced pet owner who has only had "easy" animals! A Serval kitten is like a domestic kitten on speed! If you have ever raised a kitten you know how playful (and sometimes destructive) they are. Then imagine kittens the size of a full-grown domestic cat, with way more energy! Prepare to be playfully tackled, bitten, clawed, climbed, and otherwise wrestled with by a huge kitten, and make sure you have the training experience to teach your little fireball to be gentle with humans and your house. However, if you have the knowledge of training and you put in the time, you will be rewarded with a wonderful, loving companion who is fun to live with an easy and safe to handle. A well-raised serval really is incredibly sweet and amazing. To me, it is worth every bit of the time and effort. Sirocco has an incredibly loud purr, and when he's feeling affectionate he looks at me with complete adoration written on his face, purrs, and licks me. When I get home from work he greets me with purrs and ankle rubs, and it is clear that he is very strongly bonded to me. I have had very affectionate domestic cats, but Sirocco makes his love known more intensely than any domestic cat I've ever had. However, he spends a lot less time overall hanging out purring and cuddling than a domestic cat (that high-energy thing). This may change, as I notice he gets more affectionate the older he gets. I have to say he seems really happy as a pet cat. He is very high energy and spends a lot of time on the go. As a result of lots of early socialization, he is very tame and will let even large groups of people pet him. However, I have seen him purr only once for a stranger; he seems to reserve true affection for his family. Living with a serval means having your sandal stolen from beneath your foot and carried out into the enclosure in the rain at 11:00 p.m..... Then being forced to go outside to get it lest he ingest portions of it. Sirocco had been playing out in his enclosure one evening, uninterested in being petted. When I got to bed I found myself sobbing away a heart-wrenching day's work. As I lay there, I felt a soft nose in my ear, followed by a thundering purr. When I didn't respond, he gently butted my face over and over until I said hi to him. When I spoke, he licked my cheek, then started rubbing his forehead against my face. He continued to lick my tears and "pet" me until I stopped crying. Once satisfied that I was okay, he lay down beside me, squeezing his body tightly against mine as we fell asleep. I was sitting on the edge of my bed pulling on socks one morning, having finished petting Sirocco.... Or so I thought! Approaching from behind, he laid his head on my shoulder and commenced purring loudly into my ear, paws kneading on the bed beside me. Needless to say, I abandoned my socks. Shoes and sandals have been banned from serval-occupied regions of the house ever since he ate part of one and nearly had to have it surgically removed. In response, Sirocco has developed military-strength sandal-detecting powers. Sometimes my mother will be naive enough to enter my bedroom at night to watch a movie wearing the precious contraband. Relaxing in her chair, she unthinkingly slips off her sandals as Sirocco lingers nearby with feigned indifference. He strolls casually past, then seizes the prize on his teeth and bolts cheetah-like onto the dresser and out the door to his lair, having learned long ago that thieving humans can't follow. Even if one of us is lucky enough to cut off his escape route, he will not surrender. Jaws locked on, he closes his eyes contentedly and growls as we make futile attempts to pry, pull, twist, and coax the now tooth-marked sandal from his grasp. Pouncing on the faces of sleeping humans and nibbling (that's putting it kindly) on their toes are also favorite nighttime activities. I have a deliciously slothful habit of flopping down on my bed to eat dinner. This has a great deal to do with the fact that the bed is one of the few comfortable spots in the house, and it's within Sirocco's domain so I get to enjoy his company. One afternoon I neglected to prepare a portion (tomatoes, cheese, and refried beans) for Sirocco before I crashed with a plate of Mexican food. He came up to me and pushed his nose towards the plate a few times. When I blocked him, he lay down beside me purring, drooled a little, and stretched his head out close to my elbow, chin resting on the bed. I relented and shared a couple of tomato pieces. That wasn't good enough, so he got up again only to be blocked by my hand. He did what any sensible serval would do: he snaked out his paw and smacked my tortillas! One night Sirocco had been awakening me with a karate-pounce every half-hour. I finally scooped up my rowdy serval and began to carry him out to the crate in my living room: the one now reserved for servals that won't let their humans get a wink of sleep. Trouble struck when my mother's Rottweiler mistook me for an interloper as I exited my bedroom door and charged out of the dark with a snarl. Exit serval. He was out of my arms, over my head, and back in the bedroom before the dog could take two steps. Enter bandages. I had a nice bloody welt across my jaw, and the gash in my neck caused people at work the next day to ask what I'd done to provoke Louie the Knife. Before Sirocco arrived, I'd been adamant: no litter boxes in my bedroom. Now, I'm just content when he actually uses the giant box that so gracefully adorns the floor by my entertainment center rather than peeing on my bed. One evening I came home from work to find the blankets dragged from my bed, one of them lying elegantly by the entrance to the litter box. As a thoughtful decorative touch, he'd also removed a German Shepherd figurine from my bookshelf and placed it in the litter box with one ear poking out. I think I'm going to recommend servals to interior designers. They can sell or rent them to clients, on the condition that the designer is called in every time the serval "redecorates" the house. What a way to build repeat business! One thing I'm quite proud of is the fact that Sirocco isn't very destructive indoors with his claws. For instance, he doesn't claw the curtains. He just yanks the curtain rod loose from the wall and drags the curtains under the bed. Good serval.